Disclosure: This post contains affiliate links which means if you click on one of the product links, I receive compensation. There are SO many creative ways to teach a David and Goliath lesson. In this story of the underdog defeating the Giant, we all find comfort and hope. 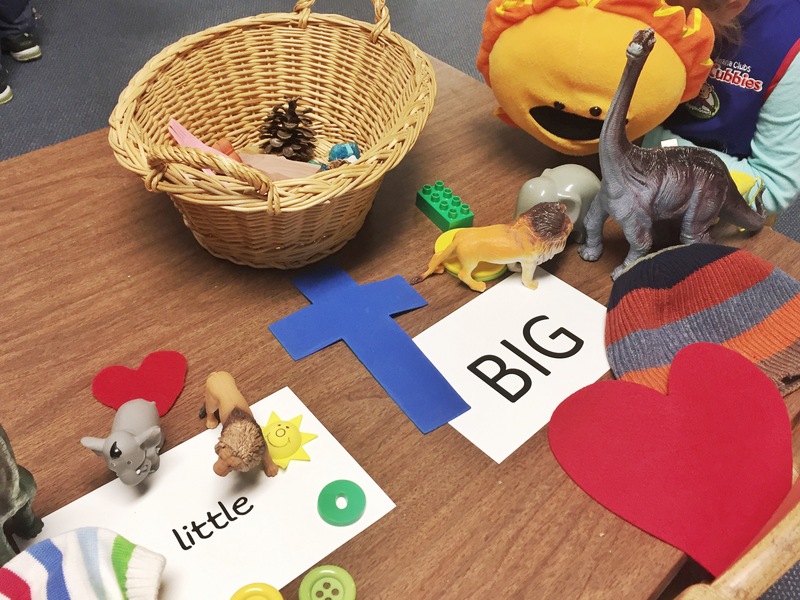 We serve a big God who so often works in unexpected ways so there is no doubt that He was the one who made the impossible, possible.Children know God is big, but they need to know that adults think he is big too! When we affirm God’s greatness, we help kids understand that we serve a God whose power doesn’t run out. A God who is there for us for all our lives–not just in childhood. In our storage area we have lots of random items from old drama performances, Vacation Bible schools, and Sunday school lessons of days gone by. 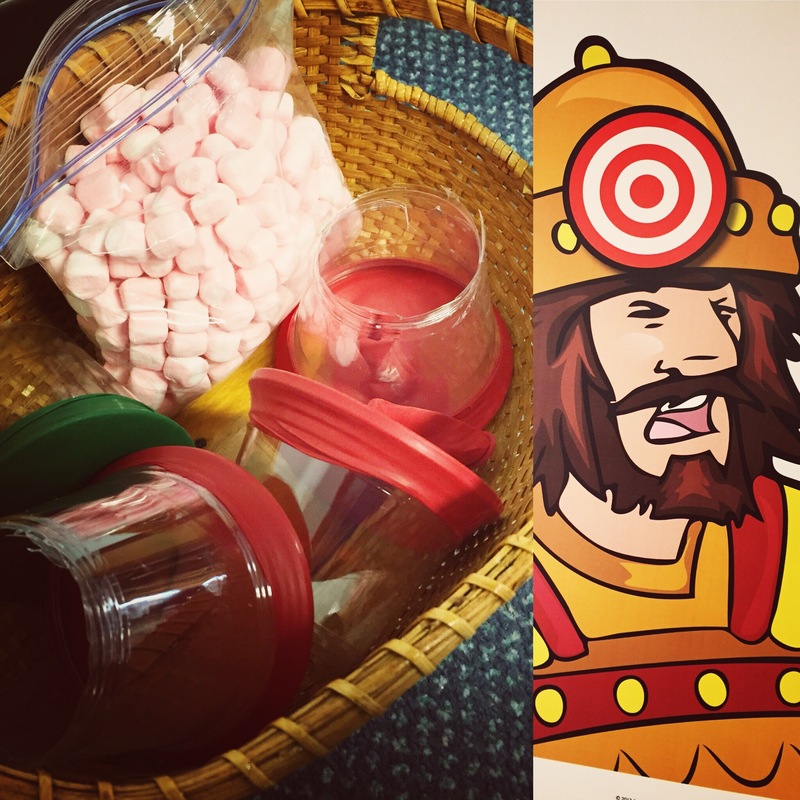 We have had to rummage through piles of stuff that just needs to be thrown out, but amid all the junk, I have unearthed a few treasures like the ones shown above to go with our David and Goliath lesson. I have a long way to go in organizing all these “treasures” but these items are so helpful as props for storytelling, pretend play, or other learning invitations. 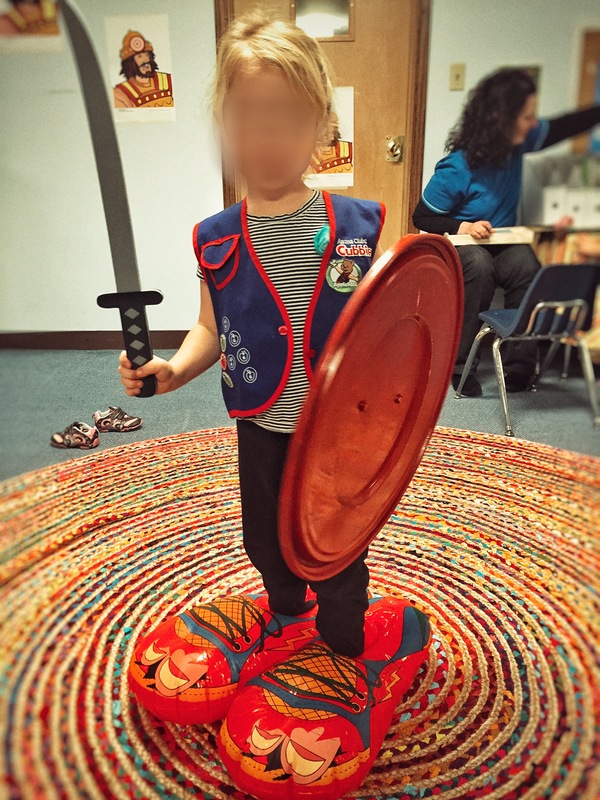 Below, one of the children got to try on Goliath’s shoes and carry his shield and sword. And another works a vintage puzzle of David as a shepherd. I laid out a sorting activity that challenged the kids to find the matching pairs of items and then sort them into big and little to emphasize the size difference between David and Goliath. We also used marshmallow shooters and tried to hit a target of Goliath. I had way more fun with this than the kids. To make the marshmallow shooters, I cut the bottom off a clear plastic cups. I doubled the cup to make it stronger. I then cut the bottom off a balloon and stretched it over the top rim. Hard, dried out marshmallows work best. 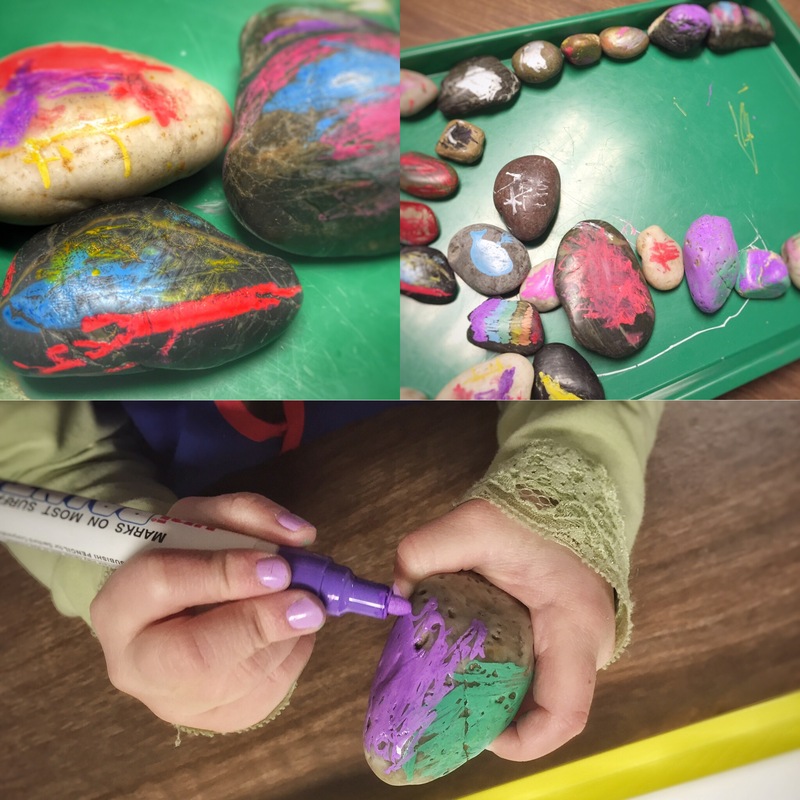 For our art activity, we painted stones to help us remember David picking up the stones using paint markers. The paint markers go on so easily and are so bright, but permanent markers work great too. This activity was from another David and Goliath lesson. 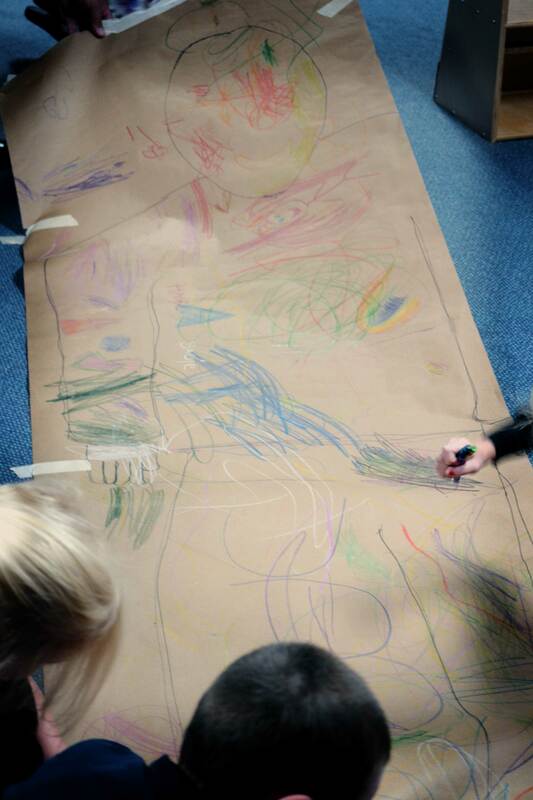 The teacher drew a simple life-sized Goliath on a roll of butcher paper and then let the children color and scribble to their heart’s content. They love collaborative projects like this and they seem to connect socially while working together. When they were done coloring Goliath, we hung him on the way to give the children a bit of perspective as to how big Goliath really was. They enjoyed posing for pictures next to Goliath. 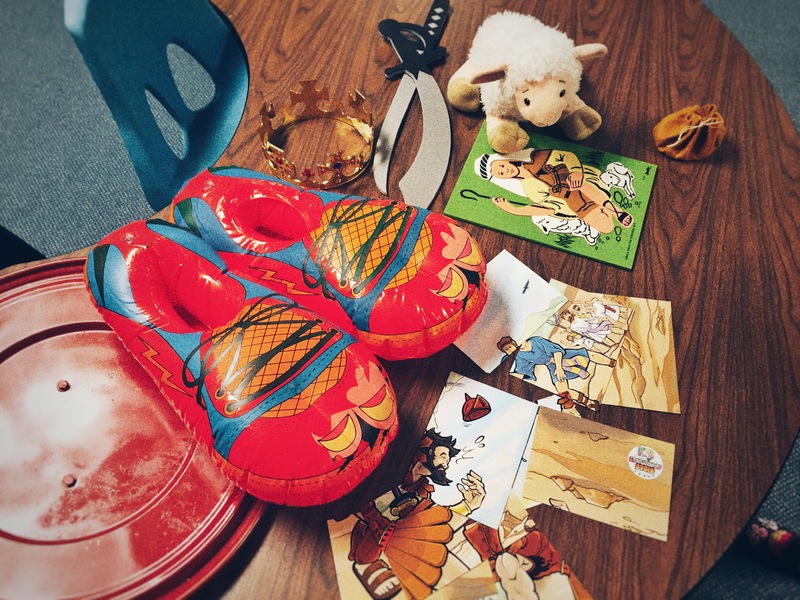 I would love to hear your creative ideas for teaching David and Goliath or other Bible stories to young children. 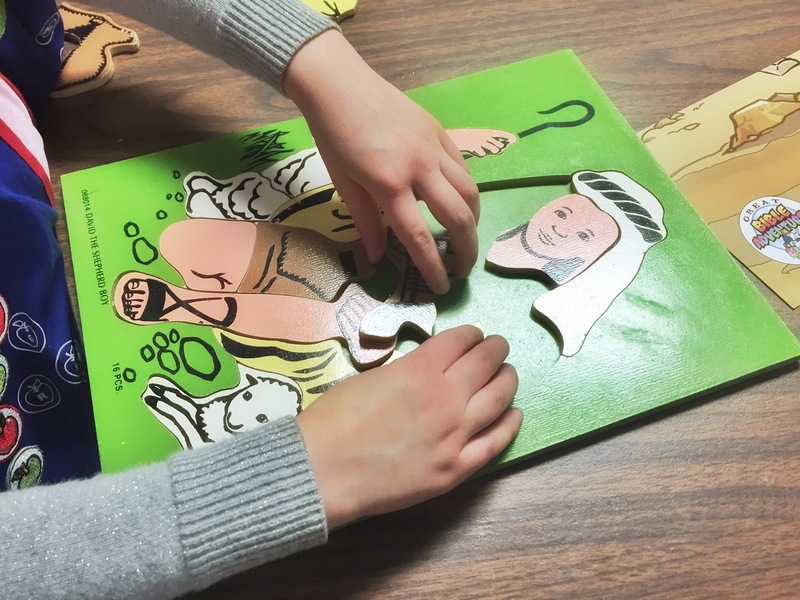 What types of activities engage your children in learning about God and the Bible?